Transport and store your console with the Verbatim Starter Kit. 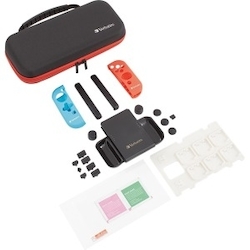 Designed for use with the Nintendo Switch, this starter kit includes everything you need to protect and travel with your console. A protective EVA case keeps the console safe, with a soft insert for additional screen protection and storage for 10 game cards. The included expansion card slot stores up to 6 more game cards as well as 2 SD cards. The screen protection film protects your console screen from everyday scratches, dust and more. This kit also includes silicon controller covers, thumb stick covers and protective plugs, offering even more protection from dust and debris. And the included controller grip is ideal for long playing times.